Bismuth Sodium Titanate Bi0.5Na0.5TiO3 (BNT) is considered to be an excellent candidate for a key material of lead-free dielectric ceramics. The phase formation and structural study is done by X-ray diffraction (XRD) which shows well-developed crystallite with a pure perovskite phase. The ceramic is sintered at different temperatures from 1050°C – 1175°C to study the effect of sintering temperature on the morphology and density. It was found that the sample sintered at 1150°C has the highest density. The microstructure of the ceramic is investigated by scanning electron microscopic (SEM) technique. 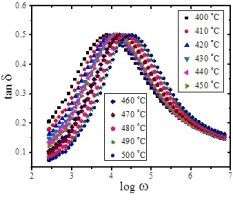 Impedance and modulus spectroscopy of the BNT ceramic are investigated in the temperature range 400–500°C. Impedance spectroscopy shows a non-Debye type relaxation and relaxation frequency shifts to higher frequency with increase in temperature. A significant shift in impedance loss peaks toward higher frequency indicates conduction in material and favoring the long range motion of mobile charge carriers. The Nyquist plot shows two semicircles, ascribed to grain and grain boundary effect of BNT ceramic. The frequency-dependent AC conductivity at different temperatures indicates that the conduction process is thermally activated and the spectra follow the universal power law. The hopping frequency shifts towards higher frequency with increase in temperature, below which the conductivity is frequency-independent. The variation of DC conductivity confirms that the BNT ceramic exhibits negative temperature coefficient of resistance behavior at high temperature.